Hey, tired new parents! Got an infant who wheezes her way through the night? This is Sandra Tsing Loh with the Loh Down on Science, saying: Get a dog! Saying, at least that’s according to a study by the University of Cincinnati’s Paloma Campo. Campo tested air quality in the rooms of 532 infants deemed at high risk of wheezing. This was because at least one parent was hypersensitive to allergens. She found that infants in homes with high concentrations of airborne bacteria—and two or more dogs—were twice as likely not to wheeze as those with no dogs, or with dogs in cleaner air. 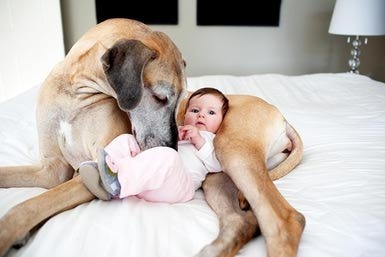 In other words, canine plus bacteria somehow equals protection for baby against wheezing! Why? One clue: These bacteria contain natural compounds called endotoxins. Such endotoxins activate human immune systems in a variety of ways. But the surprising interactive effect remains unexplained. Never mind. In a nutshell: vacuum less, get some hounds, and you’re good to go. As for that auto-repeating Baby Beluga tape? More scientific research is needed.